Who doesn’t like giveaways? I certainly do! Earlier this month I hosted my own for beautiful Daisy Jewellery silver and gold earrings but this time I had to share this one with you and it is hosted by Farfetch.com. First of all a quick note on Farfetch.com: if you haven’t shopped there you are missing out as this online retailer handpicks fashion boutiques from around the world thus brings you the most amazing and absolutely unique selection of fashion items! That is why I often feature them here on my blog – some you would not find anywhere else. 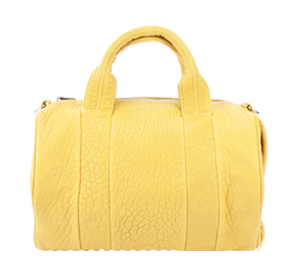 And now back to give away: it is not just any bag that can be yours for free is you apply until 5th March, it is The IT bag by Alexander Wang – Rocco and this version is so summery in washed out yellow! I am in love. Softest leather, stud covered bottom and pastel shade – this bag is an arm candy worthy of anyone’s fashion wish list. Click here to enter the competition and good luck! You are currently reading FARFETCH.com Giveaway at MY FASHION WISH LIST.